I almost made my deadline to get my baby girl's scrapbook completed before her first birthday (February 12). I'm anxious to share those layouts with you! I'm still behind on Clark's (the oldest) and I haven't even thought of getting Alex caught up. All in time, right? Anyway in all of this I haven't lost my love of ribbon. I am dying to try the new 1/8" taffeta ribbon and wanted to offer you an opportunity to try it with me. There are so many new colors in the 3/8" taffeta ribbon that I am offering two shares for you to stock up or to replenish your supply. You will get 2 yards of each of the 13 colors (Whisper White, Very Vanilla, Daffodil Delight, Pumpkin Pie, Pretty in Pink, Real Red, Rich Razzleberry, Night of Navy, Marina Mist, Certainly Celery, Old Olive, Early Espresso, and Basic Black) of 1/8" taffeta ribbon. The cost is only $23 which includes all of the luscious ribbon shipped straight to your door via First Class or Priority Mail. You will get 2 yards of each of the 13 colors (Whisper White, Very Vanilla, Daffodil Delight, Pumpkin Pie, Pretty in Pink, Real Red, Rich Razzleberry, Night of Navy, Marina Mist, Certainly Celery, Old Olive, Early Espresso, and Basic Black) of 1/8" taffeta ribbon. The cost is only $26 which includes all of the luscious ribbon shipped straight to your door via First Class or Priority Mail. If you choose to do both shares your cost is only $44. Email me if you would like to participate. I'll place the order as soon as I have 5 people. OK. 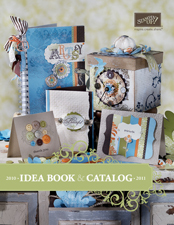 I realize that July is almost over but I just have to try the new Ribbon Originals in the 2009-2010 Idea Book & Catalog. Will you join me? 1 yard each of 3 designs (Elegant Eggplant, Always Artichoke, Sahara Sand, More Mustard, Very Vanilla), for a total of 3 yards. 1 yard each of 3 designs (Close to Cocoa, Very Vanilla, Chocolate Chip, Certainly Celery), for a total of 3 yards. 1 yard each of 3 designs (So Saffron, Whisper White, Old Olive, Not Quite Navy), for a total of 3 yards. The cost is only $14 which includes First Class shipping in a bubble mailer. :) Email me if you would like to participate. I'll place the order as soon as I have 3 people. 1 yard each of 3 designs (So Saffron, Whisper White, Riding Hood Red), for a total of 3 yards. 2 yards each of 2 designs (Kiwi Kiss, Pumpkin Pie), for a total of 4 yards. 1 yard each of 3 designs (Baja Breeze, Chocolate Chip, Basic Black), for a total of 3 yards. 3 yards each of 3 colors (Old Olive, Pretty in Pink, So Saffron), for a total of 9 yards. 5 yards of Whisper White ribbon. The cost is only $28 which includes Priority Mail shipping. :) Email me if you would like to participate. I'll place the order as soon as I have 3 people. I am so bummed that I was unable to share a fun card or project with you yesterday AND today. My UPS man delivered the ribbon and paper for my October Ribbon and Paper Shares and I have been SO BUSY cutting and wrapping (ribbon). Hopefully tomorrow I'll get to play with my new goodies and share something new with you, too! This month (November) each person will receive 2 yards of each of the 1" Double-Stitched Grosgrain Ribbon colors, 2 yards of the 1/2" Striped Grosgrain Ribbon colors, and 2 yards of the So Saffron 7/8" Poly-Twill Ribbon for only $15.85. That's a total of 16 yards of ribbon. With the new Stampin' Up! 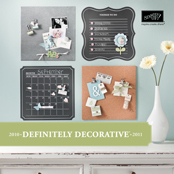 catalog now out that means lots of new RIBBON. And you know how much I love ribbon!! This month (October) each person will receive 3 yards of each of the 1/4" Grosgrain Ribbon colors for only $22.85. That's a total of 60 yards of ribbon. Let me know if you're interested. All I need is 5 people to participate. I am working on Christmas card ideas and came across these two cards on SCS over the weekend. I modified them slightly and thought you would enjoy them, too! This month (September) each person will receive 3 yards of each of the 5/8" Striped Grosgrain colors and 2 yards of the Pink Pirouette 1 1/4" Grosgrain Ribbon for only $15.65. That's a total of 20 yards of ribbon. Let me know if you're interested. I am going to offer a ribbon share each month. All I need is 5 people to participate. This month (August) each person will receive 2 yards of each of the Taffeta Ribbon colors and 2 yards of the Kiwi Kiss Satin Ribbon for only $16.27. That's a total of 20 yards of ribbon.